I was having coffee with an old friend ‘K’ the other day and it turns out we really haven’t known each other that long. She is in the process of leaving her current employer because, in part, she doesn’t feel valued. We were bemoaning the challenges presented by many of the organisations the people we know work for – the list was long and more than a little depressing. After a thoughtful pause, K looked up and asked me the obvious question “So what does a good organisation look like?” Put on the spot like that, I had no answer. It has bugged me since then and it wasn’t until today that I remembered I had already found part of the answer – while I can’t point to an organisation that exists today, I can point to one that used to! … and there in the first paragraph are the three reasons K is leaving. She doesn’t feel that she is being given the opportunity to develop her talents. She regularly experiences her responsibilities being exercised by someone higher up the organigram who has decided they do not need to consult before taking action unilaterally. Successful efforts are often just considered ‘part of the job’. 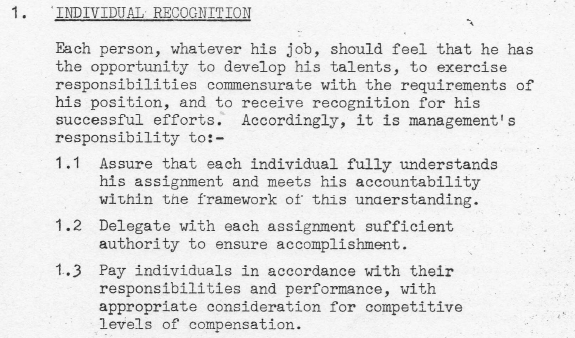 So how does my 1968 corporation suggest K’s employer avoid losing more good people? There are a total of eight points in section one but in this post I want to look at just the first three. K’s organisation is not the only one I see that regularly fails in this regard. Assure means ‘to make certain something happens’ and when you add that to each person fully understanding their particular assignment you deliver a significant challenge to the leadership of any organisation. A budget is set, authority is given and a team of direct reports is provided to create that change. Where I think that many leadership teams fail is in assuring that each person in that team of direct reports receives what they need – remember the responsibility is to each person in the organisation. In K’s case it is clear that the person she reports to chooses not to acknowledge the specialist nature of K’s role and may delegate assignments but retains authority. To my mind that adds up to a failure to meet their accountability as a manager. K is pretty clear about who is responsible but I think you need to look a little further for the cause of that failure. Stop right there. I’m sorry? You are putting someone you recognise as lacking a particular set of skills into a role that requires them to have those skills to succeed? It is the Sink-or-Swim school of management that sees a drowning employee dragged from one pool only to be thrown into another where they will continue to thrash about and drag yet more people down as they struggle to keep their heads above water. In contrast, for my 1968 corporation the focus is on developing talents, things we have already displayed an aptitude for. Organisational leadership regularly fails employees like both K and her manager. Both suffer as a result and neither are able to make the contribution they are capable of towards organisational goals. It is a lose-lose-lose situation in the short-term that quickly results in the organisation losing one or more of the means by which it accomplishes its purpose – their employees! Why is it then that leadership teams are surprised then when good people start looking for roles in other organisations? In Part 2 I touched on the third piece of recognition – that ‘competitive levels of compensation’ are necessary but will only go so far. When it is not there people notice, but when it is there the employee sees it as ‘just part of the job’. Section 1.3 now adds another dimension:”in accordance with their responsibilities and performance“. Given managers bear most of the responsibility for delivering recognition to the individuals who work for them, how many organisations do you know where the manager’s compensation is linked to their performance in retaining staff; where their bonus was linked not to the performance of the corporation but to how well they develop and recognise the capabilities of their team? I wonder how quickly organisational cultures would change if they were? This is the 3rd in my looking backwards to find a way forward series examining what corporations have forgotten in the last 50 years. The earlier piece can be read here. If you enjoyed reading this or my other posts you can subscribe and receive them via email simply by putting your email address into the Email Subscription box just on the right of the web page. You will receive a confirmation email (which some systems will think is spam so keep an eye on your junk mail) that you need to acknowledge to complete the subscription process. ← can we just forget I mentioned it?